City of Ten Thousand Buddhas at Wonderful Enlightenment Mountain is an international Buddhist community established in 1976. 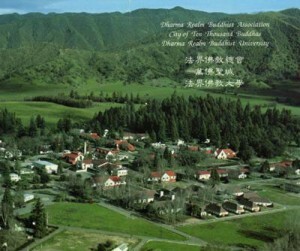 The City of Ten Thousand Buddhas is situated in Talmage, Mendocino County, about 110 miles north of San Francisco. It occupies an area of 488 acres, of which about 80 acres are presently been used. The rest of the land includes meadows, orchards, and forests. Large institutional buildings and smaller residential houses are scattered over the west side of the property. The main Buddha hall and monastic facilities, the educational institutes, the administrative offices, the main kitchen and dining hall, the vegetarian canteen, and supporting structures are all located in this complex. The environment is quiet and peaceful. The air is fresh and pure. It is the first large Buddhist Way-place in the States. It is also an international Way-place of Proper Dharma. It is said, "Welling up from the ground, the land of jeweled kingdom appeared." In the City, the light house of world Buddhism, there is no discrimination regarding religion, race, nationality, or age. We welcome people who devote themselves to the search for happiness and peace for the human race, and to the investigation of the universal truth of life. Let us work together to save the world!